The largest Goal Zero Yeti stores over 3000Wh of power for longer run times and serious projects. Includes pre-installed Solar Charging Optimization Module (MPPT) as well as mobility wheels and a handle for easy moving. Produces 1500W of continuous power and a 3000W surge for running high-power devices. • Great for use with Smartphones, Lights, Camera Equipment, Tablets, 12V Appliances, Laptops, CPAP, Display Monitors, Blenders, Speakers, Drills, Grills/Smokers, Power Tools, TV/Electronics, Fridges and much more! • Gasoline-Free Generator Alternative- From phones to fridges, power tools to lights, all the power and outputs needed to get the job done indoors and out without the noise, fumes, or maintenance of a traditional inverter generator. • MPPT Pre-Installed - Includes pre-installed solar charging optimization module that functions as a maximum power point tracker (MPPT), resulting in up to 40% faster charge times, especially from solar panels. • Includes Wheels and Telescoping Handle - Mobility kit comes pre-installed and can easily be removed when needed. • It takes the same amount of time to charge your device from a Goal Zero power pack as it does from the wall. • When charging gear with the Yeti 3000 Lithium, take note of the LCD Battery Display. If you plug in devices that have a high power requirement (a large refrigerator), the charge level of the Yeti can drop very quickly and you may not get exactly 3075Wh of energy. Also, especially when using the AC power output, the Goal Zero Yeti will be converting the energy from the DC power of the battery to the AC power needed by your device. Although your Goal Zero Yeti has a highly efficient inverter, there is still some energy lost in the conversion and you will not get the full rated capacity of the battery. • Cold temperatures (below freezing) can impact the Yeti's battery capacity. If you'll be living off-grid in sub-zero conditions, we recommend keeping your Yeti 3000 Lithium in an insulated cooler, connected to a power source (solar panels), and charging your gear. The natural heat generated by the Yeti 3000 Lithium contained in an insulated cooler will keep battery capacity at its highest. • Real-Time, Easy-to-Read Display - Advanced display features a runtime/recharge time estimator, as well as an output and input meter and a battery percentage indicator. Please Note: This product ships via freight carrier. You will need to be present for delivery. Carrier will contact you by phone regarding expected time of delivery. Having your Yeti 3000 Lithium connected to a power source, like a solar panel or wall outlet, between adventures or while in storage keeps its battery healthy and topped off. This prolongs battery life and will ensure your Yeti 3000 Lithium is charged and ready to go all day, every day. If you can't keep the Yeti 3000 Lithium plugged into a power source during storage, fully-charge your Yeti 3000 Lithium every 3 months and store in a cool, dry place. Failure to maintain the Yeti 3000 Lithium by following these steps can result in battery damage which will void the product warranty. 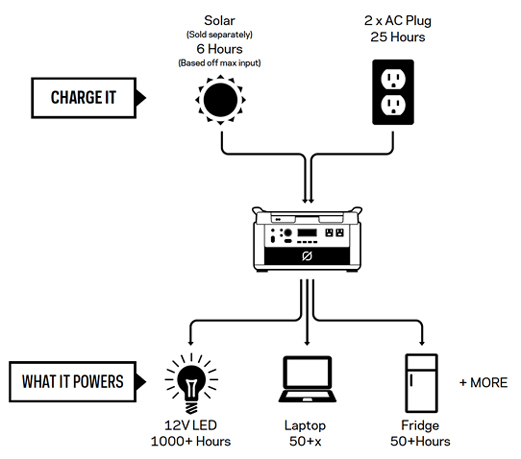 The Goal Zero Yeti 3000 Lithium can be charged by connecting a compatible solar panel. The Goal Zero Yeti 3000 Lithium can be recharged from a regular wall outlet in about 25 hours. You can charge your Yeti with solar panels, and a wall charger at the same time. The Goal Zero Yeti 3000 Lithium can now be recharged via 12V DC Input! The 12V 8mm Car Charger allows the user to recharge the Yeti Generator via Car, Truck, RV, Camper or any 12V Cigarette Lighter Input! The Dometic CFX 75DZW is the perfect choice for those who want it all. The dual zone cooling allows you to set the temperature of each zone completely independently, so you can have a double fridge, double freezer, or one of each! Ideal for use on an extended adventure when cooling needs may vary, it has a generous cooling capacity to cater for larger groups. With robust design features to withstand the rigors of any adventure, as well as flexible power options, the CFX 75DZW gives you the freedom to travel anywhere. Hi-tech features such as the integrated USB port for charging your phone and a WiFi app for convenient temperature management, complete this award-winning portable cooler. The CFX 35W is perfect for an individual or couple on a weekend adventure. This powered cooler�s low-profile design makes the CFX 35W ideal for use in vehicles with limited cargo space or height restricted areas such as underneath a truck tonneau cover. The integrated WiFi app allows for remote temperature control and diagnostics. Rugged and lightweight construction coupled with Dometic�s advanced CFX compressor and electronics system ensures ultra-low power consumption using AC, DC, or solar powered battery systems - enjoy the freedom to go off-grid! Add 15' between your Goal Zero solar panels and your power packs with this efficient extension cable, specially designed for Goal Zero. The Anderson Power Pole 15ft Extension Cable keeps your Goal Zero solar panels conveniently connected to Yeti Power Packs for a more efficient use and performance. 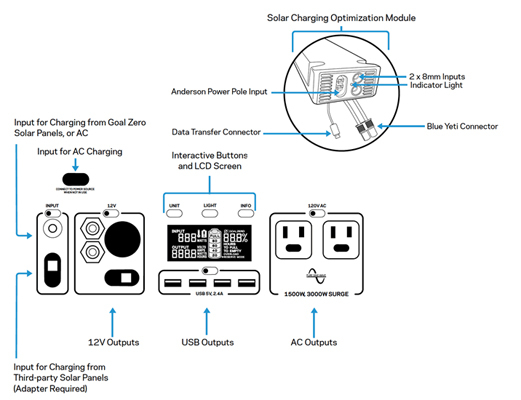 The 4x Anderson Combiner to Anderson Connector is designed to safely combine two or more Goal Zero Solar Panels with Anderson outputs into an array with a single Anderson Power Pole (APP) connector. For use with larger Goal Zero Yeti Portable Power Stations with an APP input such as the Yeti 1250, Yeti 1400, and Yeti 3000 Lithium Power packs. I purchased the Yeti 3000 for my daughter, to be used when the power is out at her house. I wired her house for a gas generator, but I felt she could not deal with a big generator. So, I installed the transfer switch that goes with the Yeti 3000. Now my daughter simply will need to plug in the cord that came with the transfer switch to the Yeti 3000 and switch a couple of switches. I've tested this system. The Yeti will run her furnace and fridge for 24 hours. She can put out four 100 watt solar panels to keep the Yeti charged if the power outage lasts longer than 24 hours. The transfer switch has four circuits. The other two are wired to the master bedroom and garage. I've ran the wires for the solar panels through the wall so the Yeti can be inside the house and charging while supplying power for the listed circuits. With the Wi-Fi I can check on the Yeti's status from my house My daughter understands how to work the Yeti. I didn't think she understood how to run the large gas generator system. My office is completely off the grid. The Yeti 3000 is not cheap, but it does a great job. It is large and heavy, and I was a little concerned about it arriving safely. Earthtech did a great job on double-boxing and such, and it arrived just fine. I've used it for a short test so far, and am very pleased with it. The digital info screen takes the guesswork out of the input and output flows. We use a Yeti 1000 already. This Yeti 3000 is great because it stores more energy. But the 3000 is also great because it comes with two AC adapters instead of one, so we can mulitplex the charging when using the wall. Also, the charge controller is an MPPT instead of the PWM on the Yeti 1000. Higher voltage input is possible with the MPPT. ProsMPPT charge controller. 2 AC adapters for DC input from the wall Sturdy wheels with extendable handle A LOT of energy is stored in here. ConsCannot charge DC from another Yeti. Charging from another Yeti is via the AC inverter output to DC input, which is inefficient. Some significant % of energy is lost as heat when doing this. Instructions do not indicate that best battery life is achieved by not charging beyond 80% and not discharging below 20%, but I suspect that this is the case since the battery is lithium ion. Please provide the voltage and daily run time of the well and we can provide a proper recommendation. Feel free to respond to this message directly or by contacting us at 877-548-3387. We hope to hear from you soon! Thank you for your inquiry! Can I use a much larger solar system like 6000 watts Grid-tieded and with a transfer switch and inverter to 120V to keep the yeti 3000 charging while grid is down?? Or how could you do something like that?? 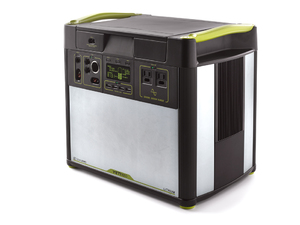 Most solar generators, including the Yeti 3000 cannot be used with Grid Tied panels. Our Humless Universal kits can utilize grid tied solar panel inputs up to 4,000 watts. It features an in-built 5000 Watt Continuous / 7500 Watt Peak Pure Sine Wave Inverter and can be connected to a transfer switch. Please see the product page below: https://www.earthtechproducts.com/humless-home-10-battery-backup.html Please let us know if you have any additional questions. Feel free to call us directly at 877-548-3387 to speak to a representative for more information. Thank you for your inquiry! Can I used the yeti. when charging with solar power? Yes, you can output power while charging the unit via solar. Thank you for your inquiry! can you operate this Yeti 3000 without the app? What if you don't have wifi? what if the internet fails? Absolutely! The App is simply an additional feature to the normal operation of the Yeti 3000 unit. Thank you for your inquiry! Can I connect the Yeti to a sub panel in my home to run circuits/appliances during a power outage? If so, what adapters/cords are required to plug the Yeti into the subpanel port? You most certainly can! We even carry the integration kit that is designed to be used with the Yeti 3000 specifically. All cables needed for connection are included. It can be found below: https://www.earthtechproducts.com/yeti-home-integration-kit.html Thank you for your inquiry! how many lbs does it weigh? The weight of just the unit is 68lbs. Please keep in mind we do offer a roll cart with the system that makes the generator more accessible and easier to re-locate. Please let us know if you have any additional questions. Thank you. We do not recommend laying the unit on its side. Please provide the watt draw of the Air conditioner and we can provide the expected run time. We will wait for your reply. Thank you! The Yeti 3000 can only output 110V. Please contact us directly at 877-548-3387 for information on the 220V model. Thank you for your inquiry! Can the Yeti 3000 power a 1500W heater or heat lamp with a 3000W surge and if so, for how long? The ac inverter output on this item is 1500 watts with a max surge of 3000 watts. If you are trying to run a heater or heat lamp with these same outputs you will only run these items for about an hour. Thank you for your inquiry! Can this source supply power to office desktops? if so, how long would it maintain operation of a standard, garden variety HP? Yes, the Yeti 3000 is a perfect option for that application. Please provide the total watt draw of the items you will be powering and we can provide the run time. Thank you for your inquiry! Yes, the battery is replaceable and is expected for release in the near future, so stay tuned! The Yeti 3000 is designed mainly for pairing with a solar input, but as long as the voltage matches the corresponding input, a wind turbine can be utilized as well. Thank you for your inquiry! Can I purchase 2-200 watt panels that will work with this system? Yes, the Boulder 200 Watt Solar Panels are best paired with the Yeti 3000 Lithium unit. The product page can be found below: https://www.earthtechproducts.com/boulder-200-briefcase-solar-panel.html Thank you for your inquiry! Can these packs be linked in series for more output. Who are your installers in CT.
What is the total weight of the Yeti 3000. The Yeti 3000 weighs 67.3 lbs. Thank you for your inquiry! About how much do replacement batteries cost? I do not see them listed here? Replacement batteries are not available as of yet. As soon as they are available we will have them available. If you would like to leave us your email address we can definitely let you know when they come available. Can you charge via solar panels at the same time there is a load applied? Yes, this is the best way to generate and output power, and will result in the longest possible operation time for your appliances. Thank you for your inquiry! For how long Can it power a fridge that consumes 11.6 amps? The 11.6 amps that you are pointing out occurs during the time the compressor of the fridge will run. Once your fridge reaches temperature the compressor then shuts off. This means your compressor will not always be running. The best way to calculate the actual average running draw would be to obtain the annual Kilowatt Hour usage of the fridge which is usually located on the yellow energy star sticker on the side of your fridge at purchase. With this information we can do the calculations for you. A standard energy star fridge for example draws 630 KW annually and that would convert to 72 watts an hour (or less than a 1 amp draw at 110v). My house is already equipped with a backup circuit panel which is powered by a Rigid 6800 watt gasoline generator. The generator connects to the house panel with a circular 120V/240V AC/CA plug. Can the Yeti use this same connector outlet to connect to my existing system? As long as you have the proper cord that has a standard 110v, 3 prong plug at the yeti end you can use it in the same fashion that you use your gas generator. How many solar panels are recommended to charge the unit? We recommend 200 watts to 400 watts of solar when recharging the Yeti 3000 Generator. Thank you for your inquiry! The Yeti 3000 comes with a roll cart (you can view the the picture of the roll cart by hovering over the pictures to the right of the main product picture.) There will be a 30' extension cord coming out next month (October 2017), as soon as it is available it will be available by clicking on the "related items" green tab above. Could I power a Sump Pump with the 3000 ? It is possible to run a sump pump on the Yeti 3000 but to know for sure if the one you have will we would need the wattage of your sump pump. Please call us at 1-877-548-3387 or email us at info@earthtechproducts.com with the information. Can this system charge my Kia Sol Electric car? Can the Kia Sol recharge this power system from its battery. This would depend on the voltage and amp draw of your car's charger and the battery capacity (size of the battery in Ah). With this information we can determine if the Yeti 3000 would work for you and how many charges you could get from the unit. You can contact us with your power requirements at 1-877-548-3387 or you can email us at info@earthtechproducts.com. The Yeti 3000 is not available and is expected for release in October of 2017. The information on this Solar Generator may change once released. At that time, we will have more detailed information regarding the operation and available combination solar kits. Thank you for your inquiry! The Goal Zero Yeti 3000 can power a small air conditioner unit for a very short period of time. However, AC units typically draw a very large amount of power, which would quickly consume the power of the Yeti 3000. Thank you for your inquiry! How many wattage of solar panels can it take max? The Yeti 3000 can handle an input of up to 360 watts. Thank you for your inquiry!